You can set up photo importing from Flickr in order to allowÂ membersÂ to easily import photos they’ve uploaded to Flickr into yourÂ NingÂ Network. To get this set up, sign in to your Ning Network and go to theÂ My NetworkÂ tab. Click the “Flickr Integration” link under the Tools section. 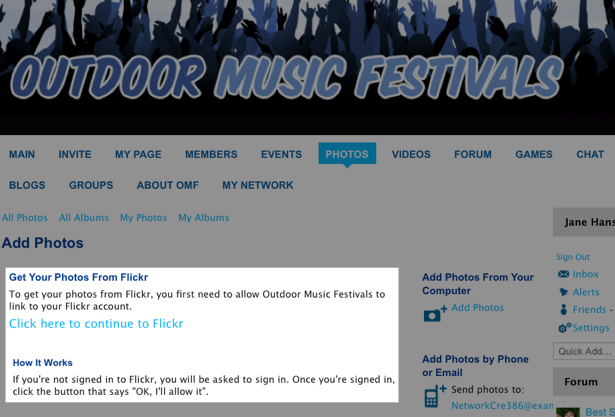 You will need to first have a Flickr account set up in order to create this integration. If you don’t have one, you can go toÂ Flickr and sign up for a free account. 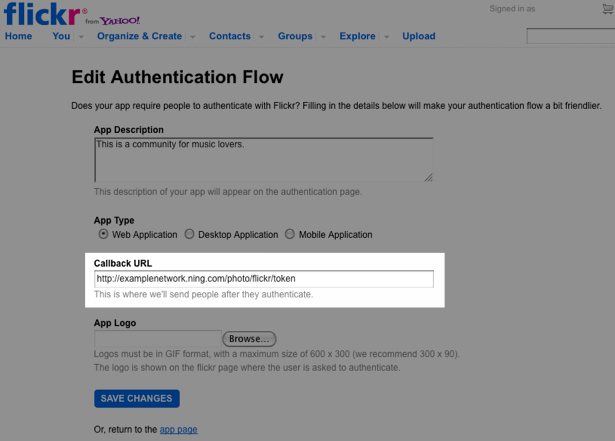 After you’ve created your account, go back to the Flickr Integration page from your dashboard andÂ right-click on theÂ “apply for a new API key” link to open it in a new tab. This will take you to Flickr’s App Garden. 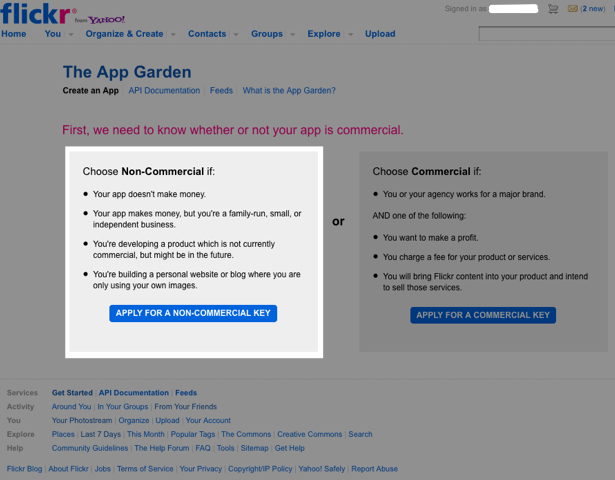 Click on the “Apply for a Non-Commercial Key” button to create an app for your network. Copy these twoÂ strings and paste them into the two corresponding fields at the bottom of your network’s Flickr Integration page, under Step 3. 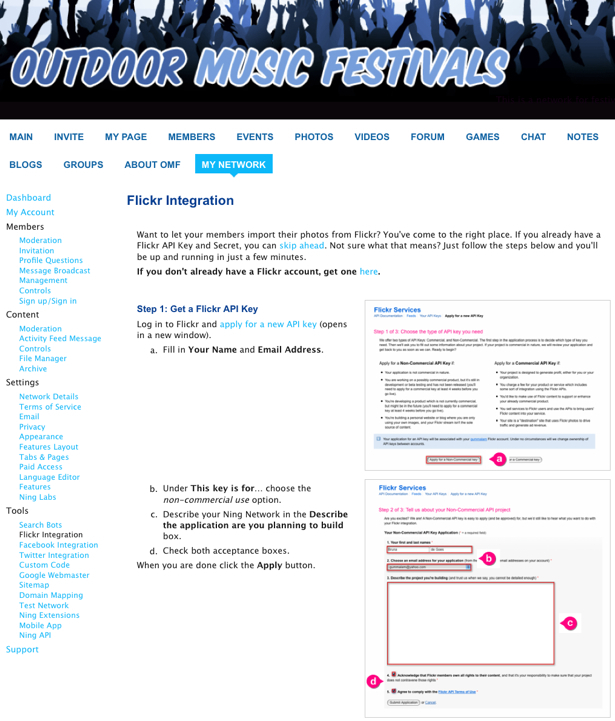 Go back up to Step 2 of the Flickr Integration page, and copy theÂ web addressÂ you see there. 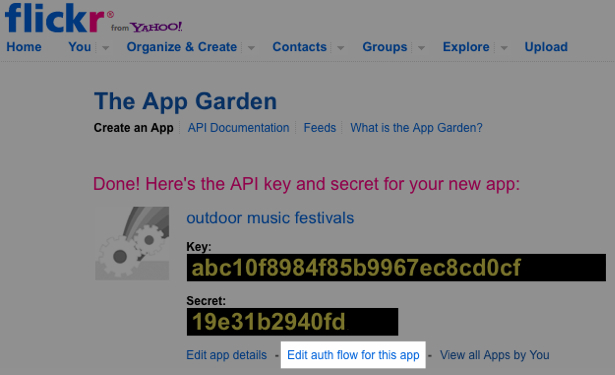 Then go back to your Flickr app you’ve just created and click on the “Edit auth flow for this app” link beneath the API key and secret. Paste the web address into the Callback URL field on the following page. The App Description and Logo are optional fields. Make sure to leave the App Type set to the default “Web Application” setting. Save your changes on your Flickr app page. Then go back to your network’s Flickr Integration page and click “Save”.Â Now when your members go to add a photo, they will be able to import their photos from Flickr. For more information, see: Import Photos from Flickr.